Tuesday, September 18, and Tuesday, October 9, 2012. 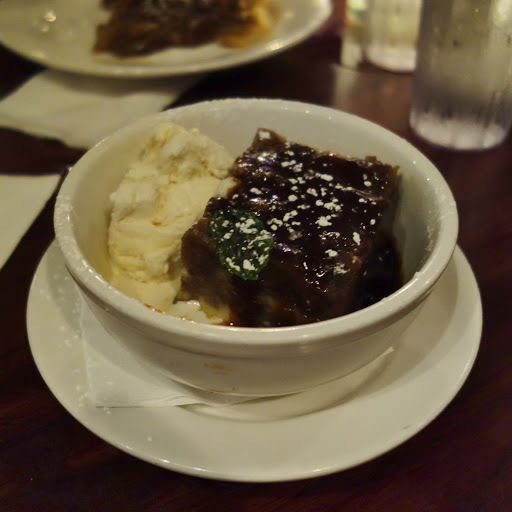 I have eaten twice at Highland Kitchen in Somerville, Massachusetts. I was introduced to the restaurant by a friend from high school named Sam. I have referenced him in my blog previously, though not by name. He is one of the more interesting people I have ever met, frequently blunt but rarely wrong. I’ve fallen out of touch with most of my high school friends but not Sam. Earlier this year we met for lunch at the MET Bar & Grille in the Natick Mall to catch up properly, and during that conversation I learned that Sam is a discerning foodie. It felt strange to realize that in five years of friendship — and I think I know him pretty well — I had no idea he was interested in food. Clearly we needed to arrange a foodie outing. Sam invited me and my boyfriend to dinner with his parents, who are apparently also discerning foodies, at Highland Kitchen. Sam explained that his family has various favorites among “specialty restaurants” (sushi, barbecue, etc. 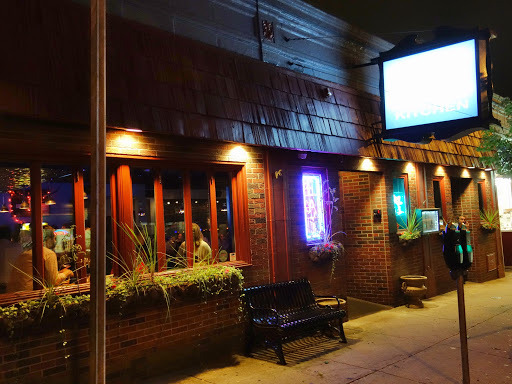 ), but that Highland Kitchen was their favorite all-around general “restaurant-restaurant.” We planned a dinner for Tuesday, September 18, giving me a little time to settle in at Northeastern and get used to my schedule. I looked forward to it for weeks. When we arrived, we were delighted to find a small parking lot behind the restaurant for patrons, as well as metered street parking. We walked inside and were greeted by a friendly host and a very low-key atmosphere. The whole room feels like kick-back-and-relax-after-a-hard-day’s-work. Stress is not welcome. I decided that I liked the ambiance before we had even sat down. Sam and his parents arrived shortly, and even if we hadn’t already known that Sam’s family are regulars at Highland Kitchen, it would have been immediately apparent. The staff swarmed to say hello. I think it’s always encouraging to see that restaurant staff remember and are excited to see their regular customers. Aside from being good service, a restaurant that takes an interest in its patrons is more likely to be serving them quality food. Speaking of. 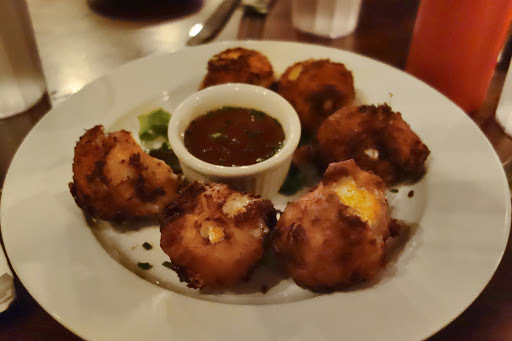 We began with a plate of ricotta-and-mozzarella fritters for the table, accompanied by chile-honey dipping sauce ($7.95). These were warm, unexpectedly light-and-fluffy, and literally melted in my mouth. And the sauce…well, honey has a special place in my heart. I often order lemon-chamomile tea with extra-extra honey and then steal a dollop to see if it can “improve” whatever I’m eating. Nine out of ten times, it does. I’m so accustomed to waiting for thick, slow honey to drip off my spoon that I was surprised by Highland Kitchen’s honey sauce, which was runny. The honey flavor was still spot-on, but now I could spread it faster and easier. This could get dangerous, albeit delicious. Ricotta-and-mozzarella fritters with chile-honey dipping sauce. I ordered the house ginger beer and was warned it would be spicy. My throat was hurting and I’ve heard that ginger ale-type drinks are good for the throat, and lo, this drink turned out to be a good decision. The strong ginger flavor was spicy but soothing — even medicinal, in my case! 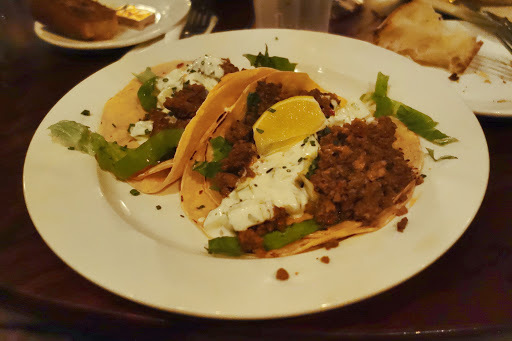 For an appetizer I chose the “aromatic lamb tacos” ($7.95), served with cucumber yogurt sauce and shredded lettuce. The warmth of lamb meat and the coolness of the sauce balanced expertly. The tacos were messy, but tacos are messy. “Aromatic lamb tacos” with cucumber yogurt sauce and shredded lettuce. Sam shares my boyfriend’s previously mentioned philosophy on burgers, that a genuinely good burger should be able to stand on its own without anything extras. No fancy toppings, no twists, just a burger and bun. Sam loves Highland Kitchen’s simple burger-and-bun, and that’s what he ordered for his entree. For me, that endorsement speaks for itself. For my entrée I selected the blackened catfish po’ boy ($9.95). Sam’s mother recommended the dish to me and then ordered it herself. As with the ginger beer, I was warned the sandwich would be spicy, but between the two the beer takes that prize. The catfish meat was indeed blackened and topped with diced tomatoes and lettuce. On the side were pickles. Sam had informed me that Highland Kitchen’s pickles are excellent. As a Pickle Person, I can second that. Try Highland Kitchen’s pickles. 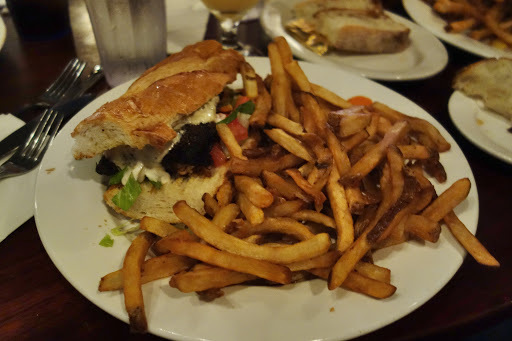 Blackened catfish po’ boy with diced tomatoes and shredded lettuce, with fries and pickles on the side. Dessert time! I ordered the “Young’s Double Chocolate Stout Float.” The waitress promptly asked me for identification. Okay, so stout is a type of beer, but it hadn’t occurred to me I would need an ID to order an actual dessert. I mean…I don’t drink, but this isn’t a drink. It’s a dessert. Oh well. My boyfriend ordered the chocolate pudding. He has a philosophy about restaurants needing to include one simple, chocolate dessert on every dessert menu, and chocolate pudding is a perfect embodiment of that. It came lathered with whipped cream and covered in crumbled peanut brittle. He was satisfied. 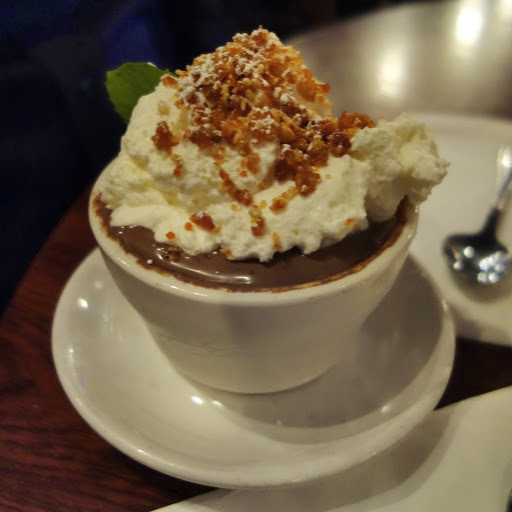 Chocolate pudding with crushed peanut brittle and whipped cream. 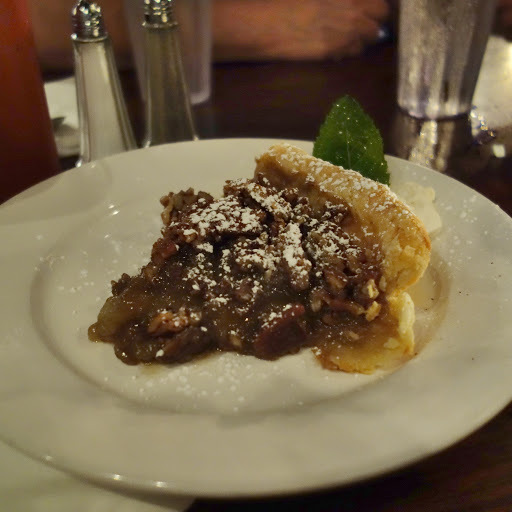 Our generous waitress brought us a pecan pie too. Soft beneath, crunchy pecans on top. Delicious. My boyfriend and I had a great meal with Sam and his parents. I began writing this post as soon as I got back to my dorm that night. Nearly a month later I had my second trip to Highland Kitchen. It was mostly inspired by working on this post. The more I wrote, the more I wanted a second trip. What’s more, I had been at Northeastern for over a month and my group of friends have all stuck pretty close to the campus — in fact, we really haven’t ventured farther than the Prudential Center area. So my dormmate Hannah and I decided to show that we are, in fact, quite the Intrepid Explorers by going all the way to Somerville for dinner. Yeah. That’ll show them! I settled on spicy coconut curried goat stew ($18), a specialty of Highland Kitchen which Sam’s mother had also recommended on our first visit. Hannah ordered mac ‘n’ cheese ($3.95) from the “small plates and snacks” section. She described it as having a “Christmas-y” flavor, which sounded odd to me but as soon as I tasted it, I understood and agreed with her. It was the cinnamon, we decided. 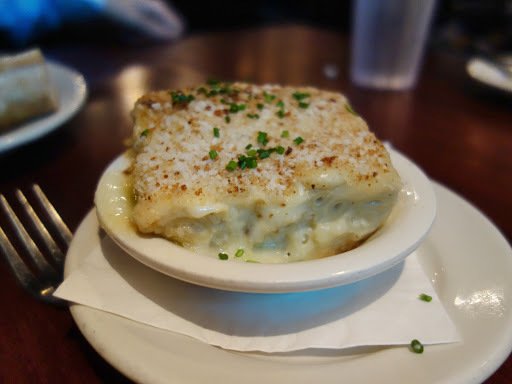 Highland Kitchen’s mac ‘n’ cheese has very creamy flavor rather than a sharper cheddar flavor. It was a bit different from what I would usually expect when ordering mac ‘n’ cheese at a restaurant, but we both liked it! 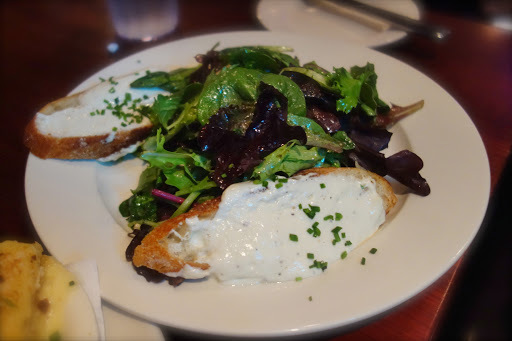 For her entree, Hannah opted for the organic green salad with sherry-mustard vinaigrette ($5.95) and goat cheese crostinis (+$2.00). Organic green salad with sherry-mustard vinaigrette and goat cheese crostinis. My first bite of the goat stew nearly lit my mouth on fire. I loved it and would return to Highland Kitchen for this dish alone. I spent the several years as a vegetarian and it does still feel a little weird to order goat at a restaurant, but the yumminess distracted me. The goat meat in Highland Kitchen’s stew was fall-apart-at-the-touch-of-your-fork tender and a good match for the dish’s other flavors. 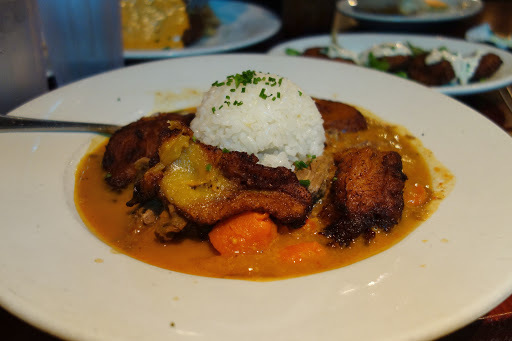 The stew came with fried plantains, which have a slightly rougher flavor than bananas, and there was a coconut flavor present as a lingering complement. Coconut curried goat stew with jasmine rice, carrots, and fried plantains. 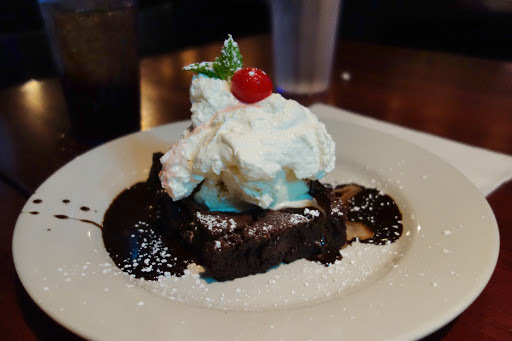 Hannah and I split a hot fudge brownie sundae ($6) for dessert. An excellent end to a second excellent meal. 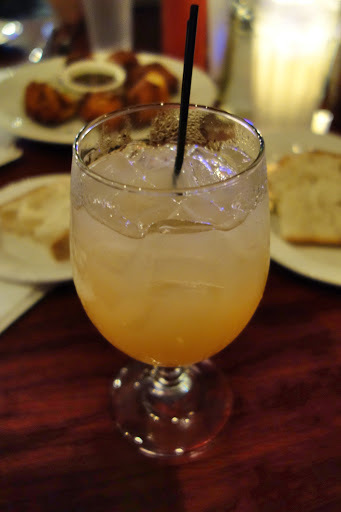 I was very happy with my experiences at Highland Kitchen and can’t wait to return again! (And again, and again …) The food was great, and equally importantly, the menu was relatively affordable for a student budget. The appetizers run in the $7–$10 range, the sandwiches in the $7–$11 range. My college friends and I are always looking for weekend restaurants that won’t leave all of us broke, and Highland Kitchen fits that criteria perfectly.